9 DE FREYRE: YA ESTAN LOS RIVALES !!! EN LA OTRA ZONA ESTÁN: DEVOTO - 9 DE JULIO - BERNARDINO RIVADAVIA - SAN BARTOLO - SP. BELGRANO DE LA PARA - LA FRANCIA - ATL. SANTA ROSA Y UNION DE ALICIA. 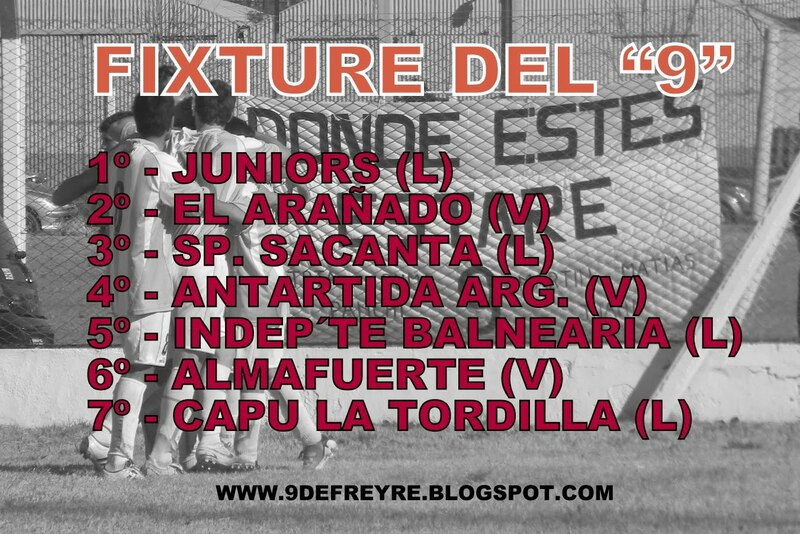 SI UNO ANALIZA EL FIXTURE, FREYRE SE VIO MUY BENEFICIADO YA QUE EVITÓ EL CRUCE CON DEVOTO Y 9 DE JULIO (NORTE), CULTURAL LA FRANCIA (CAMPEÓN ZONA OESTE), ADEMÁS JUGARA EN CASA ANTE JUNIORS, INDEPENDIENTE DE BALNEARIA Y EL CAPU DE LA TORDILLA, QUE SIEMPRE SON ANIMADORES DE ESTE TIPO DE TORNEO, PERO SOBRE TODO SE VIO BENEFICIADO POR LOS POCOS VIAJES QUE TIENE, YA QUE SOLO VIAJARA A LAS VARILLAS Y AL ARAÑADO, COMO VIAJES LARGOS, LA OTRA SALIDA ES EN SAN FRANCISCO. HAY QUE RECORDAR QUE LOS PARTIDOS COMENZARAN A JUGARSE CON DISTINTOS HORARIOS, 14:00 Y 16:00 HS.